I LOVE roasted winter squash seeds! They are very filling, and you can customize them whatever way you want. I also love the idea of reducing how much of the squash goes to waste. 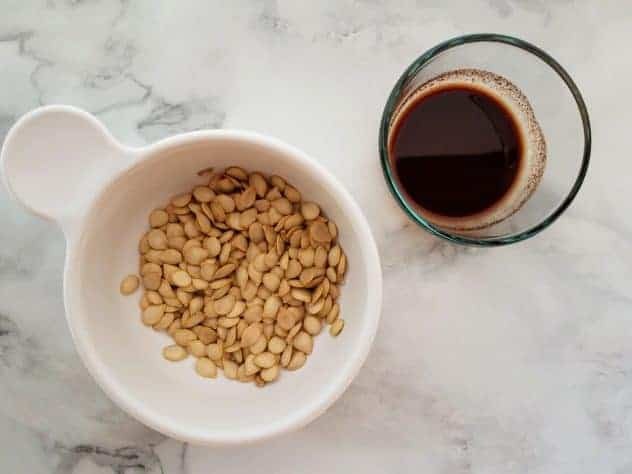 Roasted winter squash seeds are a great alternative for those with peanut and tree nut allergies, as they provide similar vitamins and minerals. While this particular recipe makes use of delicata squash seeds, the method is the same for all winter squash seeds. The only thing that might change, is the roasting time. I obtained these seeds after making some roasted delicata squash. Delicata squash is my absolute favorite, and I think the seeds might be as well! They definitely have more flavor than a pumpkin seed! Also, if you have a sweet tooth, feel free to toss in a little maple syrup or brown sugar into the mix. You could also experiment with different spice blends, like my homemade pumpkin pie spice or homemade apple pie spice. The possibilities are endless! Are roasted squash seeds good for you? Yes! 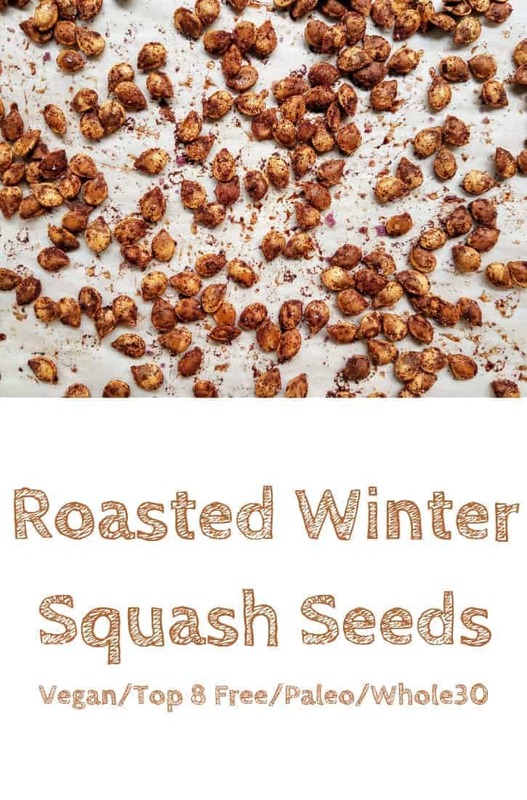 Roasted seeds from all varieties of winter squash are good for you! They are also a great alternative for those with peanut and tree nut allergies. The seeds are a great source of protein, fiber, magnesium, iron, and many other vitamins and minerals. Can you eat squash seeds? Yes! All winter squash seeds are edible and provide nutrition. 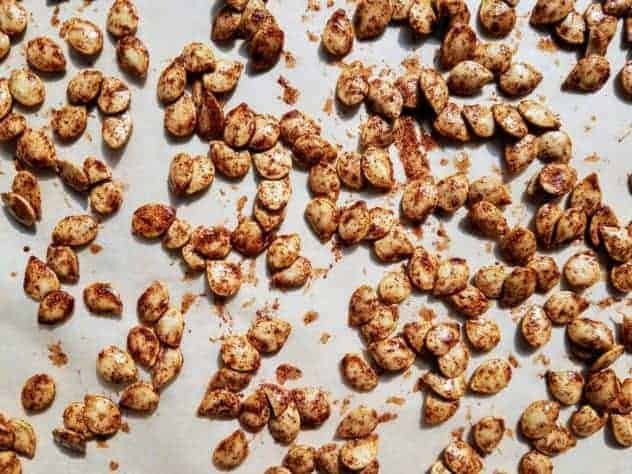 You can use them the same way you would use roasted pumpkin seeds. 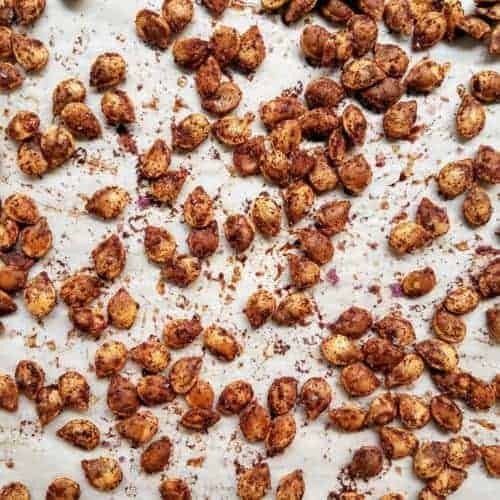 Can you roast squash seeds? Yes! Depending on the temperature range, which is generally between 275-325, and the seed size, the roasting time will vary. 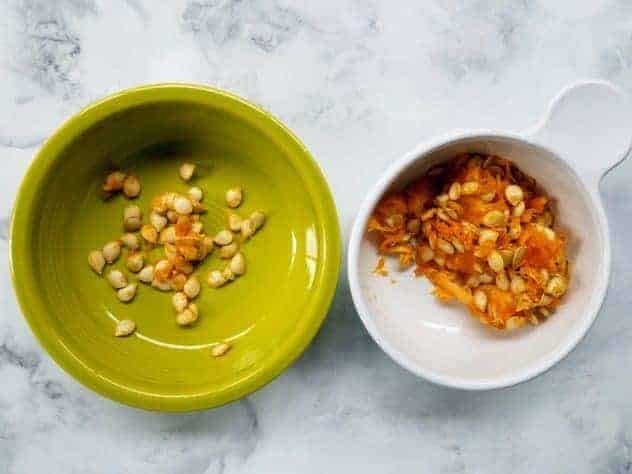 Can you eat squash seeds raw? Yes! But roasting them brings out their nutty flavor. Plus, by roasting them you get the opportunity to add any additional flavors by coating them. 1. Preheat oven to 325F. First, separate the seeds from the pulp. It’s ok if there is some pulp attached to the seeds. Most of that will be washed away when you go to rinse them. Once most of the pulp is removed, place the seeds in a strainer. I used the strainer in my salad spinner, because I was going to spin them down to dry them off. The trick to getting most of the pulp off while rinsing, is to scoop the seeds with your hand and kind of roughly squish them through as water runs over your hand. Keep doing that over and over until most of the pulp is gone. 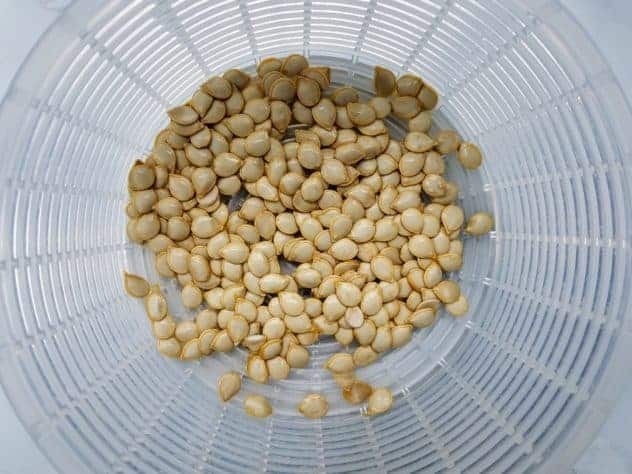 After rinsing the seeds, make sure they are thoroughly dry. I used paper towels to wick away any excess water. You might also consider laying them out on the paper towels for a few hours (or even overnight) to dry them completely. 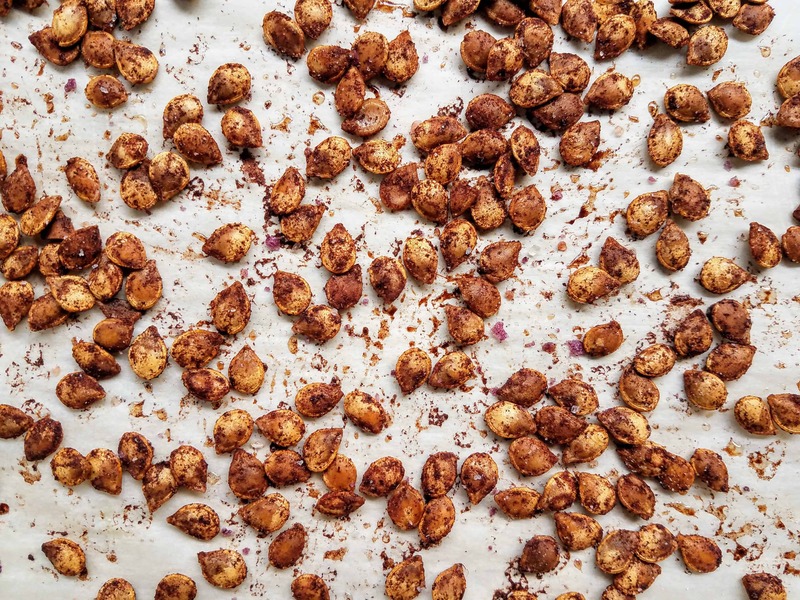 If they aren’t completely dry, then the seeds won’t be as crispy when you go to bake them. 2. Put the washed and dried seeds in a medium-sized bowl. In a small bowl, whisk together olive oil, cinnamon, nutmeg, cloves, salt, and pepper. 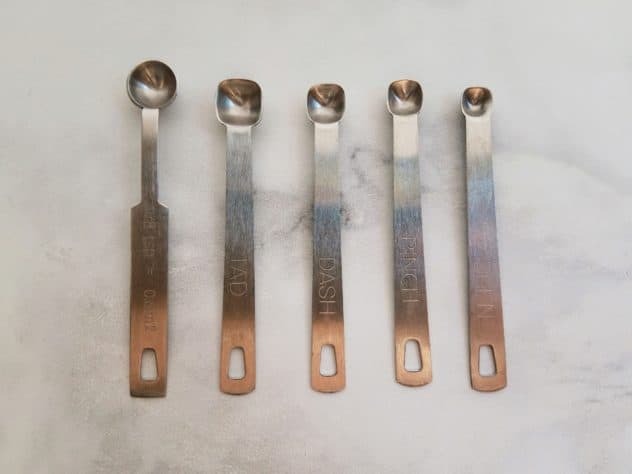 It’s worth mentioning here, that you can purchase measuring spoons for measurements like a tad, dash, pinch, and smidgen. I have included a photo showing a side-by-side comparison of them, to show how their volume compares to that of a 1/8 teaspoon. A tad of something is similar to a 1/8 teaspoon, whereas a smidgen is a very small amount. A pinch of something is slightly more than a smidgen. You’ll notice that the recipe calls for a smidgen of ground cloves, which is a very small amount. 3. 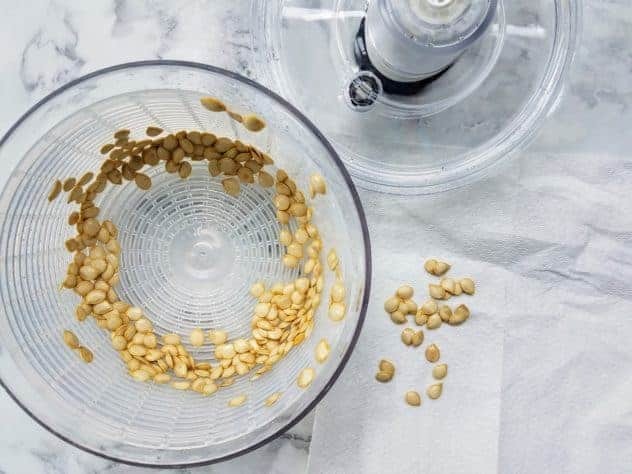 Add olive oil mixture to the seeds. Stir until all seeds are coated. 4. Line a baking sheet with parchment paper and then spread your seeds out over the baking sheet. Bake for 20-30 minutes, stirring every 10 minutes taking care not to brown or burn. Seeds are done when they are dry, crisp, and a light golden brown. This recipe is a great way to make use of seeds from various winter squash! I like to eat them on their own, but you can also add them into granola bars, trail mix, or top salads with them! Put the washed and dried seeds in a medium-sized bowl. In a small bowl, whisk together olive oil, cinnamon, nutmeg, cloves, salt, and pepper. Add olive oil mixture to the seeds. Stir until all seeds are coated. Line a baking sheet with parchment paper and then spread your seeds out over the baking sheet. Bake for 20-30 minutes, stirring every 10 minutes taking care not to brown or burn. Seeds are done when they are dry, crisp, and a light golden brown. This is great. 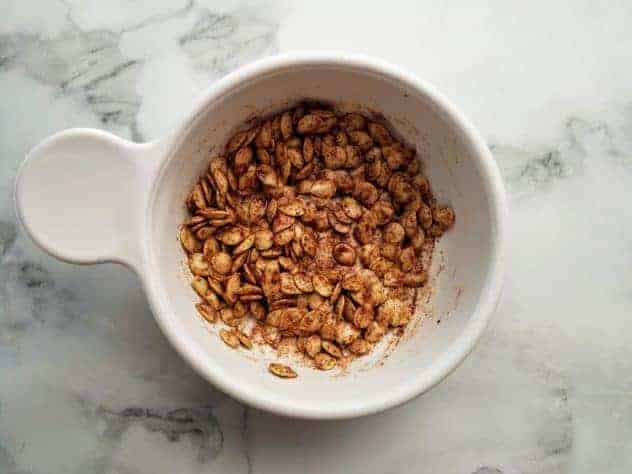 I would never even have thought to make roasted winter squash seeds and I tend to cook with different squashes in the fall and winter months. I love the flavors you added. This would make a great and easy snack especially while travelling! I printed the recipe. It really looks great and it is worth trying. Ooo, these sound like a yummy and healthy snack. Put the combo of cinnamon and nutmeg on pretty much anything and I will happily eat it LOL! Never thought of trying this. Thank you for the recipe! Looks good. That is so delicious !! i would love to try it someday!! This looks yummy and tasty. sending this recipe to my wife would love to have a taste. Oh! I love winter squash seeds. It is healthy and delicious. It is one of our favorite movie snacks. Thank you for this brilliant idea. I am making another batch this weekend. I just love the recipe, its so yummy and tasty. I really like the flavors you added, Thanks for sharing the recipe and its making method.